Spurs enjoyed their trip to the Emirates Stadium as they ran out 2-0 victors recording their first victory there for seven years. Tottenham Hotspur recorded a 2-0 victory away to their local rivals Arsenal in the Carabao Cup quarter-final at the Emirates Stadium. Spurs sought their revenge after a 4-2 drubbing just over two weeks ago at the same stadium. Wednesday's victory sees Spurs progress to the semi-finals where they will play their other London rivals, Chelsea. Wednesday's victory over Arsenal was just Tottenham's second ever win at the Emirates Stadium. "Of course. It's a derby. I think the feeling Arsenal felt was a massive challenge to beat us. They celebrate how they feel because they felt it was a massive game for them. Last night we won and celebrated our way," he said. Spurs took a 1-0 lead into half-time through a Heung-min Son opener in the 20th-minute. "If we win we are humble. If we cannot win, with dignity. That is the most important in life, but football the same. It's important to celebrate and enjoy when we win. And dignity when we lose. Always it's so important." In the second half, an Arsenal fan threw a water bottle onto the pitch which struck Dele Alli on the back of the head. "Of course he's more mature now. He's more mature. He's a kid, he's still young, but he's clever and he's more mature. It's normal this process," the 46-year-old said. This incident comes just weeks after a Spurs fan threw a banana on to the pitch in the previous NLD and said fan received a four-year football ban. "Like us, we are growing and growing. I think it's a situation that when I think that I hate this type of situation and action. 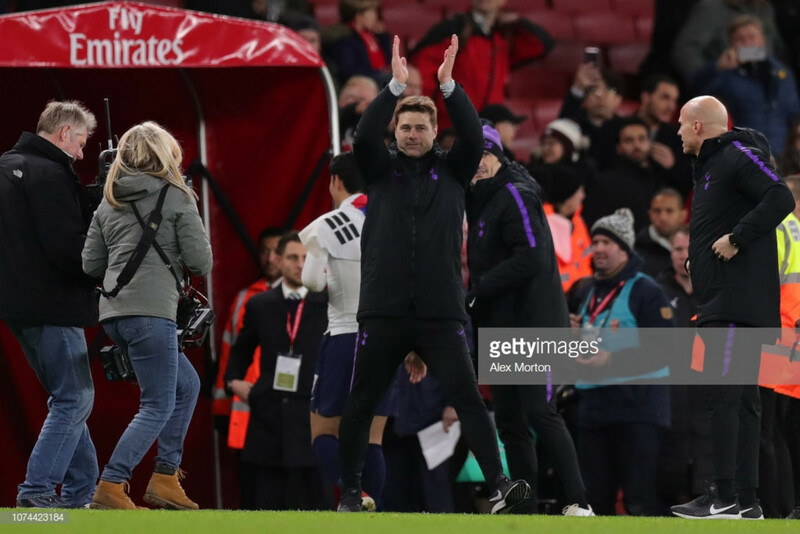 "I know very well that Arsenal will take responsibility and fix that problem, but of course we need to praise Dele because his behaviour was fantastic," Poch added. Danny Rose returned to the side at the beginning of the month and has since locked down the left-back position. "I'm happy, not only for him but the team." The Leeds-born left-back shone in Tottenham's 1-1 draw away to Barcelona two weeks ago which saw Spurs progress to the last 16. "We managed that period well. Danny of course in the last few games has had the opportunity to play. I'm so happy with his performance," Pochettino added.